This painting was my contribution to the original 78Tarot project, a collaborative deck featuring artists from around the world. 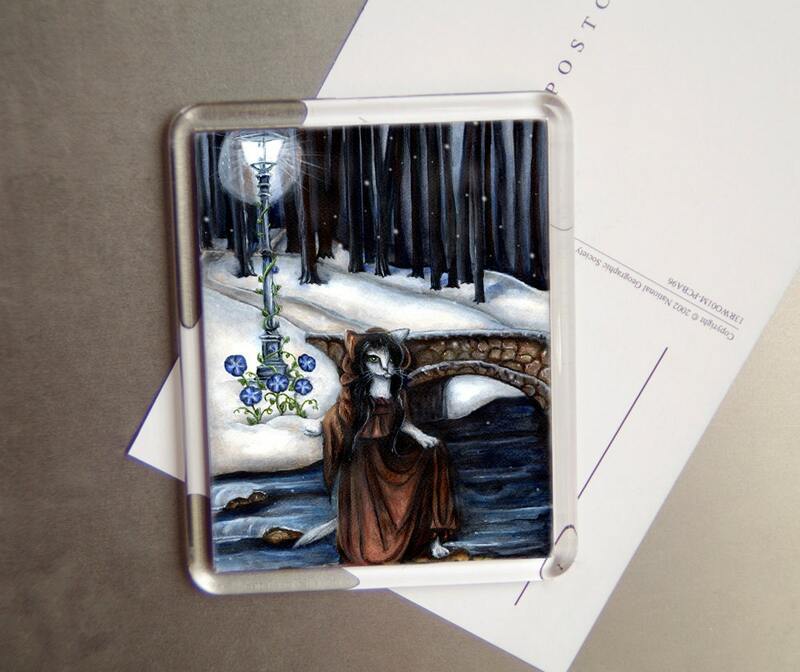 I was given the "Five of Pentacles", a card representing struggles and hardship (the ragged figure in the snow) but also a reminder to recognize and accept assistance (the bridge), and to maintain a positive perspective (the lamppost). 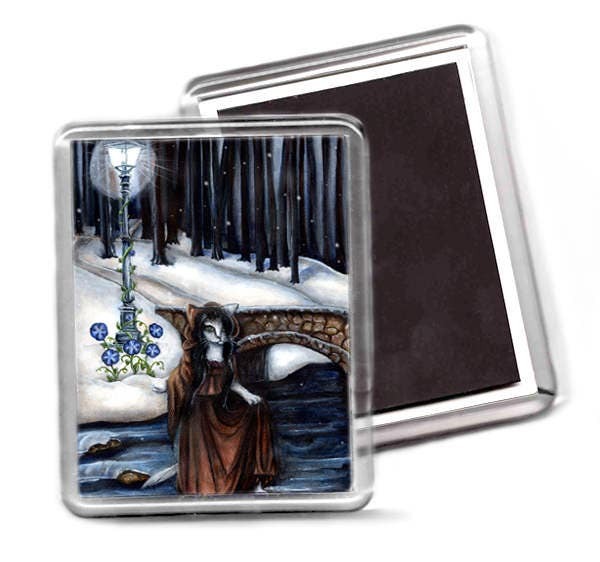 My acrylic magnets are large and sturdy, 1/8 inch thick, with a colorful reproduction print of my original artwork, "Five of Pentacles" inside. The magnet measures 2.5" x 3.25" (6.35 cm x 8.26 cm). I make these individually in my studio, using Ultra Premium Presentation Matte paper and Claria Hi-Definition ink for each print, which I trim and assemble inside acrylic blank frames with strong magnets added onto the back. My magnets ship securely wrapped in a padded mailer via First Class, within 2 business days after receiving/clearing payment. Interested in the 78Tarot project? 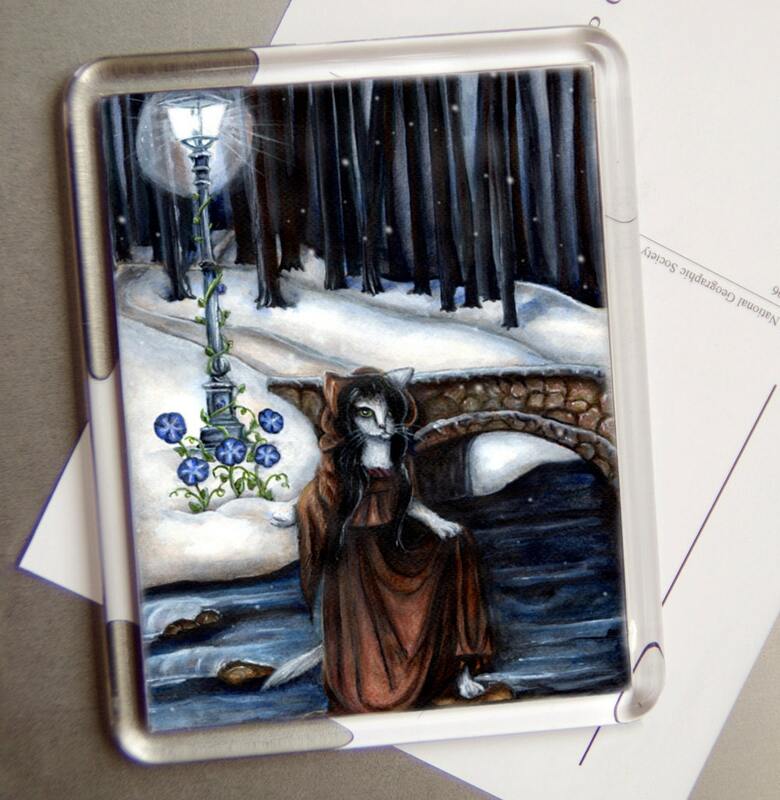 And check out the official 78Tarot Etsy shop! Artwork ©TaraFly, 2014. All rights are reserved. I gladly accept PayPal and credit cards. I will also accept money orders and personal checks for the exact amount of your total purchase... please allow up to 10 days for the check to clear before shipping. Please make payments promptly. If I don't receive a payment within 7 days, unless I hear from you, I may decide to cancel the sale and relist the item. I am curently shipping via First Class worldwide. International customers will be responsible for paying any additional customs' fees and taxes that might be required. If you'd like a different method of shipping, please send me a request *before* purchasing so that I can adjust the shipping cost. I want you to be excited about your purchases! If my work didn't meet your expectations, or was damaged, please notify me of the condition within 2 days of receipt, and we'll work out a replacement or refund that suits you. Obviously, custom work is encouraged!! Many of my portraits were, in fact, special commissions using pets' photos. My cat artwork is also available for licensing, wholesale, and consignment arrangements... so please inquire via convo here, or e-mail me: (tarafly@taraflyart.com) if you are interested.